Ellen congratulates Jessie on her latest academic success and mentions plans to visit Lyme for the summer. I can't tell you how delighted we all are at the good news in your note this morning! It is perfectlysplendid! quite the best thing that could come to you in your college course, and the one, of course, that gives us most pleasure, as well as yourself. I am just so happy about it that it is useless trying to express it! And it is so perfectly delightful that it should come to you just as it did, without your making any special effort to get it, or sacrificing other important interests to it throughout your college course. We are very, very proud of you, my darling. I am sorry Flora did not get it too, but I take leave to believe that the faculty are better judges than you as who best deserves it!I have a pile of letters that must be written at once so I must cut this short. By the way, your father has decided to sail on the 20th of June, and we will all go to Lyme on the same day. We are to stay at Miss Griswold's with the artists, and Mr. DuMond is to teach the class. I am sure we shall have a charming summer. 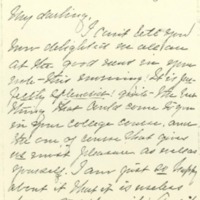 Wilson, Ellen Axson, “Ellen Axson Wilson to Jessie Woodrow Wilson Sayre,” 1908 May 6, WWP17439, Jessie Wilson Sayre Correspondence, Woodrow Wilson Presidential Library & Museum, Staunton, Virginia.